This area of the website is lots of random fun... dolls that don't fit into basics or monsters. Newest set for sale... 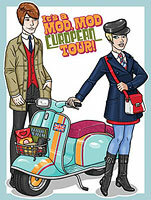 It's a Mod, Mod European Tour! 1960's inspired fashions... scooter included! This is a first for offering 2 dolls in a set, as well as my first male character! Theta & Zeta are also available for sale! Free downloads in this section are a mini Steampunk inspired doll, as well as the one and only "full size" doll set I will be offering for free, Cosplay Jane. She is based on awesome female comic and cartoon characters!